HomeFeatured BandsSHRAPNEL: From Humbling Beginnings To An Unstoppable Force. Despite the studio learning curve, The Devastation To Come was a whopping success for Shrapnel. The album gained the band international attention in the thrash metal underground and catapulted Shrapnel to the fore front of the UK metal underground – a scene with more high quality thrash bands than one can count. Shrapnel’s new found popularity opened the door for a lot of new and exciting opportunities. “Playing with Sacred Reich and Death Angel within the space of a week was great. Being able to support Suicidal Tendencies at the Electric Ballroom was both amazing and terrifying” says Martin. Shrapnel were more popular than ever before and were becoming harder and harder to ignore. In February of 2014, The Virus Conspires was released to overwhelmingly positive reviews. The band even found themselves apart of Metal Hammer’s special Thrash Metal issue. “Being in the same list as some of those other new bands is insane for us. I’m a huge Vektor fan and to me they’re just miles ahead of us so yeah, to be in the same ‘ones to watch’ list is massive” says Martin regarding the band’s feature. 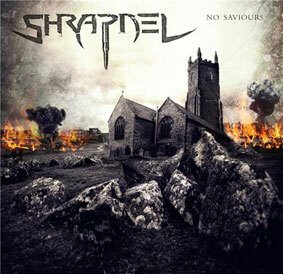 Following the album’s release Shrapnel went on to support Overkill and Xentrix on a short tour of the UK and made an appearance at both Hammerfest and Thrashasaures 3, which took place in the band’s home town of Norwich. It’s clear Shrapnel are poised for greatness. The band has a young and hungry attitude and their music not only stands out, it’s a cut above most. Only time will tell, but if Shrapnel stay on the path they’ve been on since their formation, we’re going to be hearing a lot more from this band for years to come. Italian Thrashers MADMAZE Announce New Line Up.